Handmark releases New York Daily News app | BlackBerry Blast! 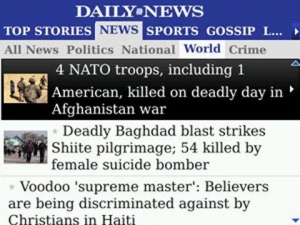 Handmark has released an app for the New York Daily News. The app is released for BlackBerry, iPhone, and Windows Mobile devices. The app is supposed to give you quick access to the New York Daily News content, but we're wondering why users won't simply use an RSS reader. If you can't resist downloading a new app you can get the New York Daily News app at the link below.